Moose Farts - A super easy to prepare, no-bake cookie treat kids will love! Moose Farts. A super easy to prepare, no-bake cookie treat that kids will love and maybe giggle a little at the name too. Recently, a follower of the RockRecipes Facebook Page messaged me and asked if I had a recipe for Moose Farts! My first reaction was, of course… whaaaaat!!? Then, suddenly I thought, wait, where have I heard that before. The nagging familiarness finally gave way to a memory of a trip to Gander for an event my daughter was participating in a couple of years ago. On that weekend in Gander we ate at Rosie’s Diner and Bakery twice. Once for lunch and back again for breakfast the next morning. The diner food we had there was top notch, from the classic club house sandwich and fries I had for lunch, to the toutons and eggs the next morning . Rosie’s is definitely worth the few minutes off the TCH if you are driving through Gander. As you enter Rosie’s, there is a small display from their in house bakery with fresh bread, cakes and cookies. I suddenly remembered looking at one of the display cases with Spouse and there was a hand written sign in front of one of the piles of cookie trays announcing in bold letters “MOOSE FARTS”. So these were a thing after all. A few discreet enquires with friends in Central, and fewer degrees of separation than six later, I was able to procure a recipe that I was assured was as near a facsimile to Rosie’s famous Moose Farts as I was likely to find…if not the genuine article itself. Having never tried Rosie’s Moose Farts, I can make no such declaration. Perhaps someone from Gander who knows them well, will have to try the recipe and give us a definitive opinion. This no-bake cookie confection could not be easier to make, and would be an ideal snow day project if you have small kids about. I immediately sent the recipe to my nephews Nate & Luke in Edmonton, who are still in Primary School. I know they will be thrilled to tell everyone at school they made “Moose Farts”. LOL! I can just see their grins now. 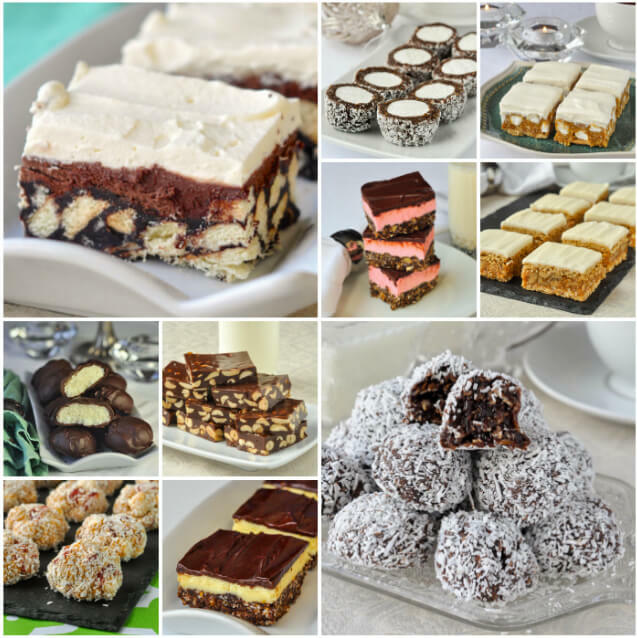 These are also a great addition to my collection to our growing collection of Freezer Friendly No- Bake Cookie Treats. I’ll bet there are at least a few other’s you’ll want to try there too. Like this Moose Farts recipe? 2018 Update. 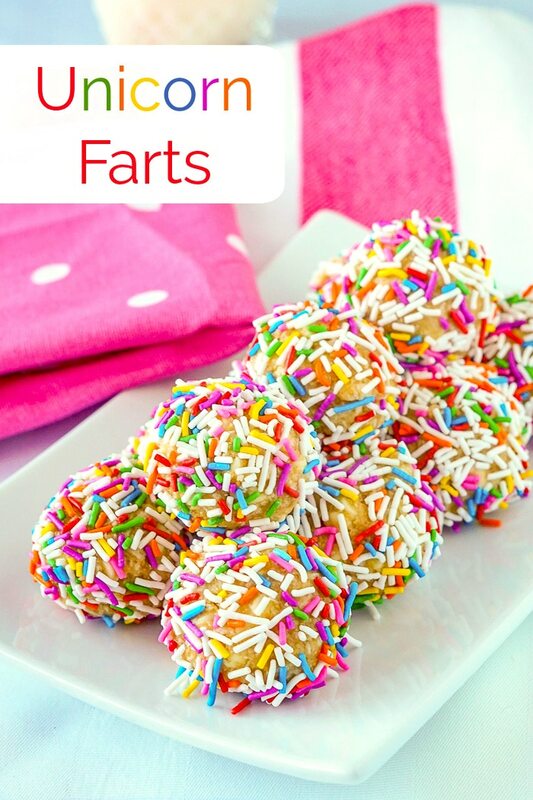 We have a new version of this recipe that’s ideal for kids birthday parties Unicorn Farts! Moose Farts - A super easy to prepare, no-bake cookie treat that kids will love and maybe giggle a little at the name too. Previous Post: « Newfoundland Blueberry Jam with lime, using low sugar pectin. Re the Moose Farts – you could rename them Reindeer Farts at Xmas time! These are spot on!! Just use mini chocolate chips instead of the regular size ones and you have an exact replica in my opinion. I believe they use semi sweet 🙂 Thank you Barry! My grandkids will adore these. Mostly because they can say Moose Farts and get everyone’s attention with a laugh! I can just see those smiley faces! Thanks for sharing. In Northern Ireland we have a similar recipe for a cookie we call 15’s. In ours though instead of chocolate chips we add glacé cherries and mini marshmallows and then roll them in desiccated coconut. I tried this recipe for something different and it was very popular especially when I told everyone what they were called. Your cookbooks are sold out on Amazon, indigo and the Chapters stores. Do you know if they will be restocked before Xmas? Sorry I don’t know. It’s up to Amazon to reorder from the distributer. Are you in Canada? I use unsweetened. These are very sweet with the condensed milk anyway. I’m so happy to have a Canadian food and recipe blogger from the Maritimes no less, where almost all great Canadian recipes originated. Well, pretty darn close anyway. Thanks for the fantastic recipes and tips! I’m not a fan of coconut. Any thoughts on substituting with rice krispies? Any other suggestions besides coconut? Thanks, they sound yummy and easy! Lots of people have suggested that. Thanks, going to give them a try! I’ll let you know how they turn out! Unsweetened coconut. Semi Sweet or dark chocolate chips. Is there any thing else you could use instead of coconut? People have suggested ground nuts or even rice krispies. I use icing sugar for those who do not like cocoanut for the marshmallow squares. You could try a light dusting of that. No unsweetened. The condensed milk is sweet enough! These look and sound amazing! My question….not everyone in my family likes coconut. Is there something I can use as a substitute? People have suggested ground nuts or rice krispies. Is there any substitute for the coconut? This sounds like such a fun recipe! Thanks for sharing this recipe for Moose Farts. My wife and I just (5minutes ago) finished making them. I tasted them very good. My question is can they be frozen? 300 ml is only 10 oz US. Up here in the frozen north? You didn’t get the memo that I’m in Newfoundland? We had 30 cm of snow this weekend! LOL! Yes, those product sizes can be confusing because of the way this product is sold on both sides of the border. The American measurement is NOT fluid ounces, it’s in ounces by weight. In Canada the regulations dictate it be measured by volume, hence 300 ml cans. But…if you weigh the contents of your 300 ml can on a scale, guess what you get? That’s right, 14 0z! So long story short, it’s the same can, of exactly the same size, on both sides of the border. That could explain the problem I had today with another recipe I made, after adding another 1/2 can of sweetened condensed milk. lol. Just made them again today. 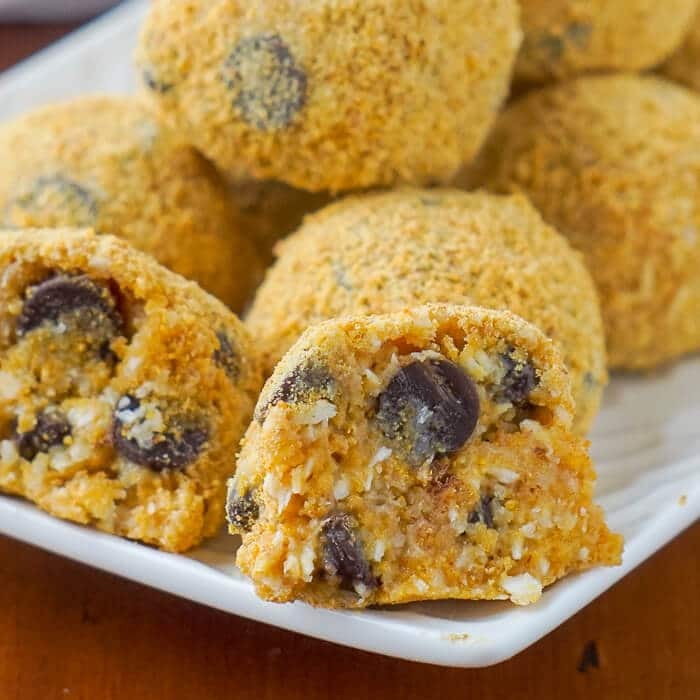 They are great and quite versatile using either rice krispies or ground nuts. Will be sharing them with a group of senior women and a new senior moving into our small complex. I can see their eyes POP now at the name. They are wonderful especially at holiday times or for birthday parties – just serve them in mini muffin cups and it’ll be an instant hit. My family loves these cookies, I have been trying different mini chips each time I make them and so far the mini peanut butter chips have been the favourite. I also tried the Oreo crumbs instead of graham cracker crumbs, this was also delicious. We made these as is today, but my youngest who is obsessed with unicorns suggested putting mini mms instead of chocolate chips and calling them unicorn farts. Having family just thirty minutes from Gander, I’ll have to see if anyone living there has tried this out. OMG that’s brilliant. I might try that! hi Barry i would like to make the fart cookies. Can i keep them outside and how long. Am I the only one to think of adding popping candy to the mix, the idea of popping poop is pretty funny. These cookies are AMAZING! I have a family member who is not fond of coconut as well. Instead of nuts or rice Krispies, I wanted to keep them chewy so I used rolled oats. They turned out great! Any recipe I make for my son that calls for coconut, I replace with rolled oats to keep the consistency as close to the original as possible. Hi Barry, I was looking at everyone’s comments and got me thinking. you call them Moose Farts so what about rolling them in plain cocoa. my mother did this to rum Balls and since they are sweet you could you could use the unsweetened or sweetened which ever. Thank you for joining me up to your site, so far just looking through Im lovingg it. I do weekly cooking for our local rual firefighters & I can’t wait to do theMoosr farts, sure to get a giggle out of these….what could I exchange the coconut for please ? What are the best substitute for sweetened condensed milk? I’d love to try making these fart cookies but afraid it’s gonna be too sweet for me as I don’t quite like desserts that are overly sweet. Sorry, no substitutes for this. Either is fine. I like the honey ones! This is our second year in .a row making Moose Farts! This year we melted the chocolate chips in with the sweetened condensed milk and butter first, then stirred in white chocolate chips with the dry ingredients. 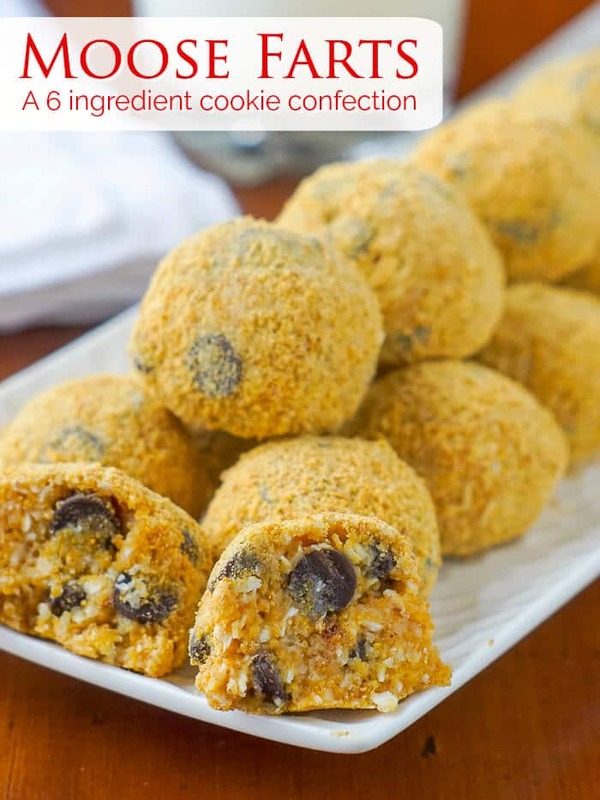 They’re extra fudgy and delicious and great for making with small kids who love potty humor and have a short attention span when it comes to baking! 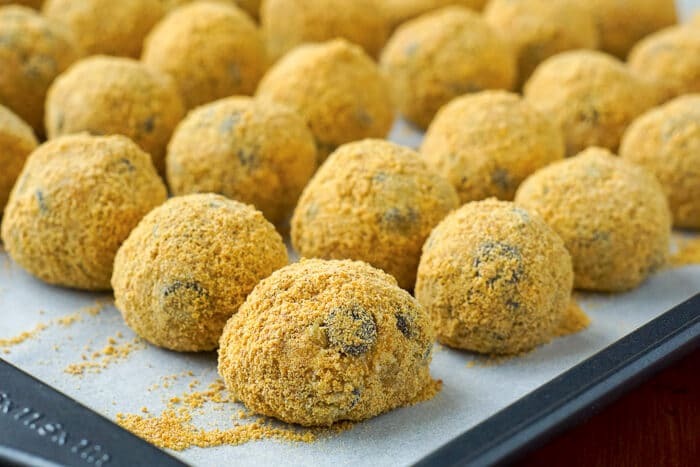 Moose Farts have replaced rum balls as my favourite spherical Christmas confection. At the risk of sounding blasphemous, has anyone tried incorporating rum into these? Or would the ruin the consistency of the mix? I don’t give 5 star ratings but these… oh my. My neighbor is a Newfie and I’m going to surprise her with them later. I did have to modify and use oats instead of coconut because it’s Super Bowl Sunday and I was NOT going back to the store. They’re quite delish with the substitution. Made these for Valentine’s Day with my granddaughter who had a disappointing day at school. We added snipped dried cherries, rolled them in pink and red sprinkles(yuck, but I am a grandma after all), and called them Cupid’s Farts. Suddenly the disappointing day at school was funny and the boy who didn’t notice her was no longer as cool as I was. Take that Mr. Not so Cool. You were replaced by Cupid Farts. Lol. I put 2-3 tsp of cocoa powder in my cookies and it takes away some of the sweetness put they are still very good. I made 4 of your cookie recipes for Christmas at our house as well as Christmas plates for family and friends. This is one of the recipes. Everyone loved them!